* Came off the bench in all 22 appearances on the season and missed three games due to international call-ups for the Iceland National Team. * Her converted penalty kick in the seventh round of PKs against No. 1 Virginia secured FSU’s third consecutive ACC Championship and fourth overall in school history. * Finished third on the team with eight goals and fourth on the squad with 18 points. She accomplished this in just 916 minutes of playing time, which ranked 13th on the team. * Scored the game-winning goal in FSU’s 1-0 victory over No. 1 North Carolina on October 11. She collected a long dropkick from GK Cassie Miller and shot from 15 yards on her first touch as the Noles earned their second all-time victory over the No. 1 team in the country. * Recorded a .222 shot percentage, scoring eight goals on 36 total shots, to lead the team among players with at least 10 shots on the season. * Registered a goal in three of the first five games of the season – at New Mexico, at No. 14 Florida and vs. No. 3 Texas A&M. * Her goals against the Lobos and Aggies proved to be game-winners in the pair of 3-1 victories. * Tied for second on the team with seven points (three goals and one assist) in ACC play. * Posted a pair of two-goal games – scoring twice against Pitt on October 3 and Evansville on November 13. * Assisted on Elin Jensen’s game-winner at No. 16 Notre Dame on September 27, continuing through a crossing pass from Megan Connolly to give the Noles a 1-0 victory on the road. * Earned an assist against No. 21 Texas A&M in the NCAA Quarterfinals as she found Jensen near the top of the box after winning the battle with a defender for a rebound of the goalkeeper. * Ended her three-year career with 63 points on 27 goals and nine assists. * Saw action in 24 games as a redshirt sophomore, including two starts against Minnesota and Oklahoma. * Finished third on the team, sixth in the ACC and 51st in the NCAA with 12 goals. * Added four assists and ended with 28 points, good for 8th-best in the conference. * Earned her first All-ACC honor, placing on the Third Team with Isabella Schmid. * Scored the game-winning goal in the season-opener against Portland on August 22. She narrowly beat the whistle at the end of the first half, putting home a ball from 30 yards out in the 45th minute. * Recorded a season-high four points on a trip of two-goal games against Stetson (Sept. 14), at UConn (Sept. 18) and at Miami (Oct. 4)…she now has five multi-goal games in her career. * Over half of her shots on goal found the back of the net, scoring on 12 of her 23 shots on goal (.522). * Registered a goal and an assist against Louisville – both in the second half – in the Noles’ 6-0 win over the Cardinals on Sept. 25. * Ranked second on the team with 13 points (five goals and three assists) in conference games. 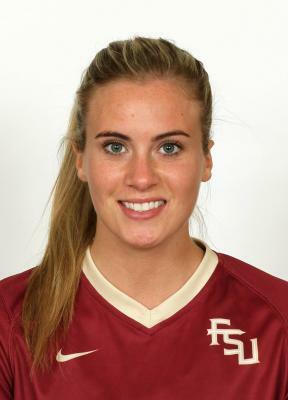 * Played a season-high 56 minutes in FSU’s 4-0 win over NC State on October 26, tallying an assist on Dagny Brynjarsdottir’s goal in the 38th minute as the Seminoles took a 3-0 lead into the half. * Posted three points on a goal and an assist against South Carolina to send Florida State to its fourth consecutive College Cup and eighth overall in program history. * Started 26 matches in her first full season at Florida State. * Finished fourth on the team with 17 points, third in goals scored with seven and second in shots with 51. * Recorded over 1,800 minutes on the pitch during her redshirt freshman season. * Posted a career day in just her second collegiate match notching five points on two goals and an assist in a 4-1 victory over Auburn…marked her first career points – goal and assist – against the Tigers. * Became the first Seminole in 2013 to register a multi-goal game scoring the first and third goals against Auburn…finished the season with two multi-goal games. * Tallied two game-winning assists on the year with the first coming in overtime against UCF and the second in the first round of the NCAA Tournament against South Alabama. * Scored the equalizer at Duke answering a Blue Devil goal just 48 seconds later in the first half with a blast from 20 yards out that found the upper left corner for the goal…the Seminoles would go on to win 2-1 for their first victory in Durham in 10 all-time tries. * First career game-winning goal came against Miami finding the back of the net in the 16th minute of a 4-0 victory over the Hurricanes…scored her second goal of the game less than 10 minutes later for her second career multi-goal performance. * Also scored goals in league play against Boston College and Maryland. * Finished the ACC regular season with five goals in 11 matches…tied for 11th in both goals scored and goals per game (0.45) in conference games only…one of three Noles to reach double-digit points against league foes during the regular season. * Started all six of FSU’s matches in the NCAA Tournament and played all 97 minutes in the national finals against UCLA…finished the postseason with one point on an assist in the opening round against South Alabama. * Recorded a career-high five shots in a win over NC State…fired at least one shot in five of FSU’s six postseason games. * Earned seven caps as a member of the Full National Team. * Played with the Full National team at the 2010 and 2011 Algarve Cup. * Member of the U-17 and U-19 teams. * Holds the record for the most goals scored at the U-19 level – tallied 17 goals in 25 games. * Appeared in 13 games with the U-17 team and scored 11 goals. * Played for IBV and formerly Breidablik. * Earned the Most Promising Player in Breidablik in 2010. * Awarded the Golden Boot in Breidablik in 2010 and in IBV in 2011. * Scored 14 goals in the Pepsi League in 2011 – the third most goals tallied in the Icelandic league that year. * Daughter of Thorvaldur Heidarsson and Solveig Anna Gunnarsdottir. * Majoring in social science.